These pages give information about me, my father and the work I do to promote his legacy. My father is the late Sir Nicholas Winton (1909-2015), who organised the Czech and Slovak Kindertransport in 1939 to rescue endangered children from the Nazi threat. 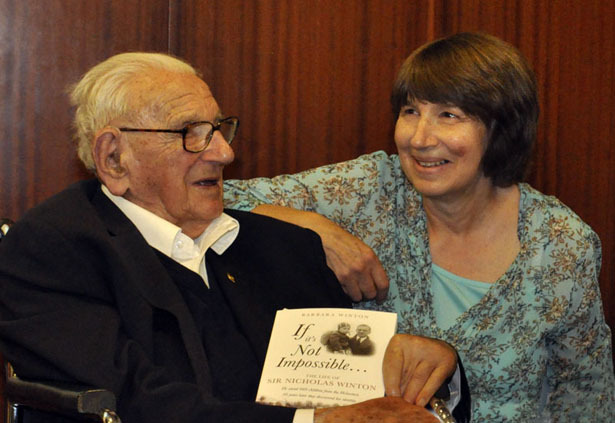 In 2014 I wrote a biography of his life: If it's Not Impossible...The Life of Sir Nicholas Winton. The book was launched on his 105th birthday and I was proud and thrilled to present him with the first copy at a party at the Czech Embassy in London. Since that date, I have given talks about Sir Nicholas to many varied audiences in the UK, USA and the Czech Republic. My aim is to tell his story as an example of positive action and to spread his message that helping those in need is not only the right thing to do but a most rewarding way to spend your time. If you are interested in more information about my father, his life and legacy, do please get in touch. Also if you or your group or school would like a talk or information for an exhibition, display or research, I would be happy to help.